2nd Edition: I’ve finally re-established most of the links to this article and apologise to any readers previously inconvenienced by unavoidable breaks. It’s a perennial problem when linking to reproductions on commercial gallery sites, in particular. Also, Blogger allow links to open in separate windows now - a far better arrangement for comparing illustrations with text. Heilstätten – David Zwirner, New York, Nov 4 – Dec 17 2011. The show continues the artist’s trend to darker pictures, more restrained colour and more integrated spaces, dominated by male figures now often in 18th or 19th century costume, while females remain essentially in modern dress. All are absorbed in civic celebrations of obscure origin or leisure. The themes of bizarre animal mutation (Die Turme 2011 -The Towers) and futuristic technology (Rota 2011) linger, but for the most part industrial and institutional settings have given way to suburban gardens and grand traditional architecture. Significantly, the show takes its title from the interlocking scenes of Heilstatten 2011 – Sanatorium - underlining a sense of retreat, exhaustion. Activities are less about manual labour and competition now than compliance and participation*. 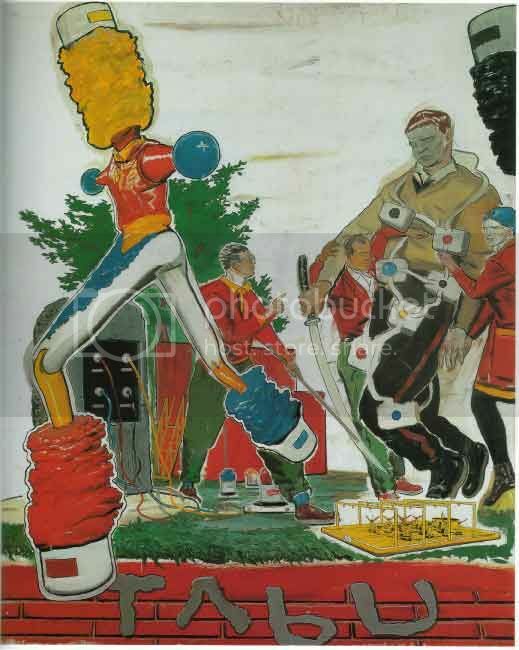 The many models and plans that once guided and mocked settings, along with corporate livery and logos, have dwindled to just the artist’s easel or the traditional play of pictures within pictures (Das Kreisen 2011 - The Circle). In this sense, the work feels more like a version of Surrealism, rather than the standard descriptions of a postmodern hybrid of Pop, Socialist Realism and Surrealism, a shrewd pictorial intertextuality, that have greeted the work since the end of the last century. Undeniably, there has been a narrowing of interest, a condensing of means that leaves the work more literal, less linear or stylised, more forthright and comfortable. The Leipzig-based Rauch is now a major figure on the global art scene, emerging in the late 90s and attracting patronage in America, awarded the Vincent Van Gogh Prize for European Painting (in Maastricht) in 2002, inspiring ‘The New Leipzig School’ of younger artists and students (based on his position at the local art academy) a survey at the Centre for Contemporary Art in Malaga, Spain in 2005, a commissioned show for the Metropolitan Museum of Art, New York, in 2007, a work from 1998 (Etappe) sold for almost a million US dollars to film star Brad Pitt in 2009, extensive retrospectives at museums in Leipzig and Munich in 2010, marking the artist’s 50th birthday, that drew record crowds. The prolific artist has also been shrewdly marketed, ensuring visibility in public collections as well as curated surveys and art fairs. The work resists mere virtuosity, caricature and pastiche in revisiting past styles – notably avoids citing individual styles or works – while equally eschewing realism or genres derived from photographic sources – two principal strains to contemporary painting. Instead, Rauch mines a seam of generic stylisation that ultimately rests with distinctions of picture plane and painterly abstraction, while allowing a free-ranging iconography that has proved challenging. The formal framework to Rauch’s project has always promised much and it is this above all that earns him a place at the fore of contemporary painting. Interpretation, for the most part, stresses social factors and is divided between readings that find a critique of East Germany’s communist ideology and those discerning a broader German tradition stretching back to Romanticism and embracing Beckmann and Beuys, now given exciting new scope. The first is too narrow to properly grasp the work, the second too broad to say anything of interest. 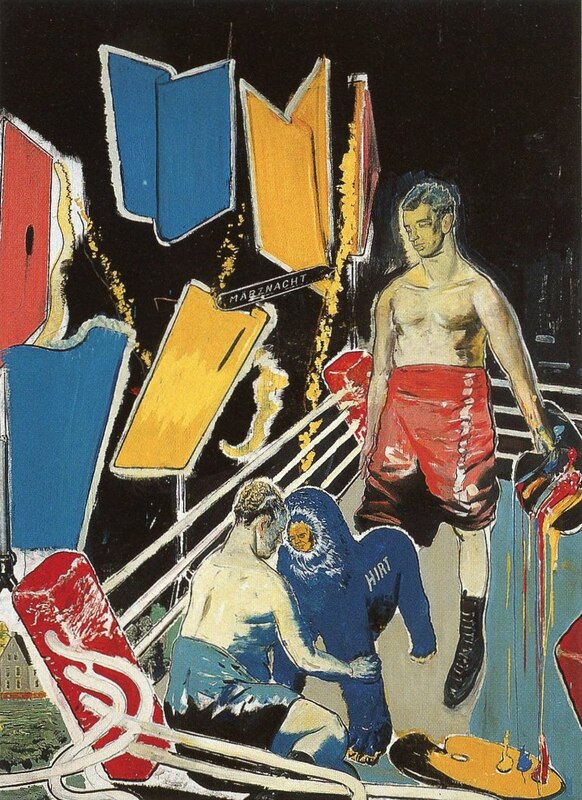 A pivotal review in the New York Times in 2002 (by Roberta Smith), for instance, described Rauch as ‘the painter that came in from the cold’ in renouncing Socialist Realism. An ideological agenda seems particularly desirable in America. Yet the claims that Rauch draws on socialist propaganda in some way are unsupported by examples and none of the artist’s candid interviews mention such sources. At best, he recalls attending ‘Youth Dedication’ ceremonies and general social constraint (true of many strict upbringings and a complaint familiar to adolescents everywhere). The basic line drawings he introduces to his work in the mid 90s unquestionably allude to common print sources, as instruction or text illustration, as do the speech bubbles and captions that often accompany them in early work, but there is nothing specifically socialist or East German about these, if anything, they belong to the 30s and 40s (so pre-date the German Democratic Republic) and similar line drawings can as easily be found in the work of Glenn Baxter or the early work of R. B. Kitaj, such as The Ohio Gang (1964) or Walter Lippman (1966). Moreover, eccentric distortion to proportions and gestures in figures (see Fang 1998 or Lokal 1998); further distance them from set print sources. In short, a critique of Socialist Realism looks wayward or wishful as interpretation. 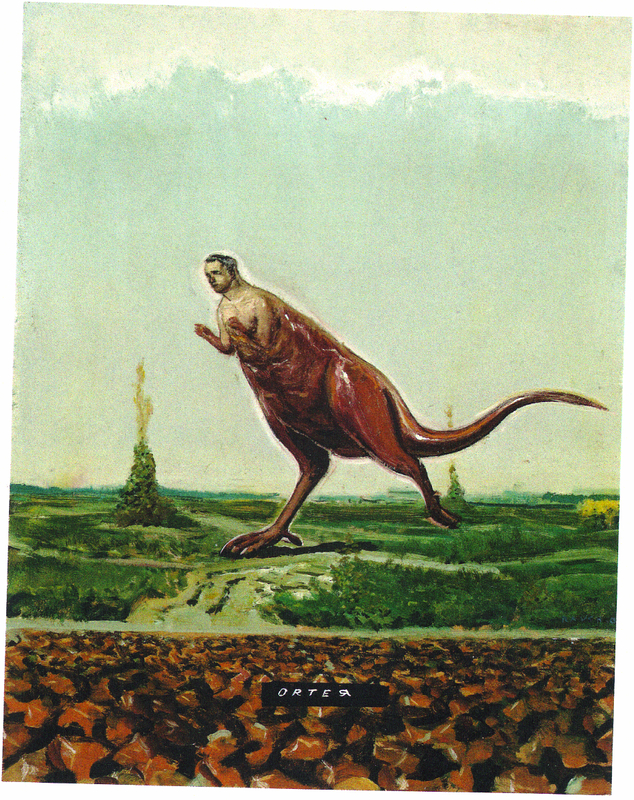 Rauch’s illustrational figures surely emphasise that the tasks and surroundings pictured are no more than plausible plans or ideals, demonstrations of various scientific or industrial undertakings, even where their exact nature remains obscure, possibly absurd. The pictures often include small architectural or 3D models, (Reflex 2001, Eis 2002) diagrams or maps to reinforce the point. Again, such activities were not exclusive to East Germany or socialism. The gap between illustration and concept is more to the point. Content is further distanced when painted on an imposing scale, underlining a cursory, even contemptuous handling and against the reductivism or stylisation of the graphics. As paintings, they distance themselves not just from the activities, but the very pictures that convey them. 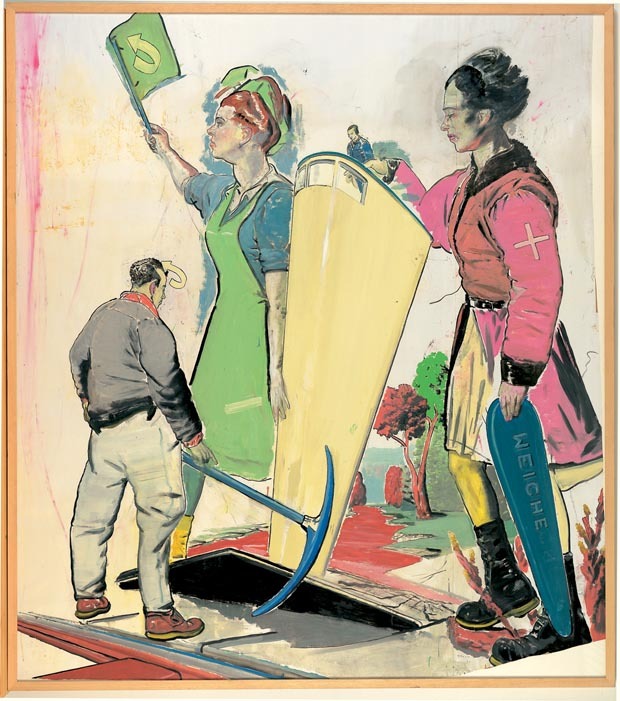 The contrast between a recognisable print style and a reckless painting treatment allows them to express profound suspicion or doubt in the efficacy of pictures, their adequacy as reference - and not just where they depict alienated workers. The many disjunctures in scale, proportion, tone and perspective only amplify doubts over the identity of depicted objects and relations, their function within a picture. 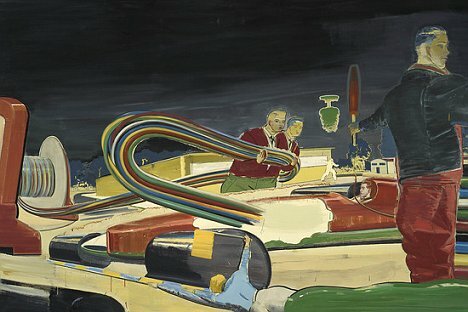 Conversely, the obscure tasks of science and industry may be taken as a metaphor for painting’s remote and arcane adjustments to pictorial meaning, as endorsement of painting’s deeper scrutiny. Rauch’s work need not be approached solely in terms of social factors. The focus upon the figure engaged in baffling tasks, supervision and rivalry, the attention to costumes or uniforms, even extending to hairstyles and footwear, suggest not so much labour conditions, but an attention to roles and relationships. Indeed, given the artist’s unusual first name and its vivid image combined with his family name, which sounds more like an alias or project, it would be surprising if the issue of personal identity did not figure in the work. A psychological interpretation duly discerns a deep insecurity, an inability to fit in, or sustain a role, an impatience or distrust of a wider situation or commitments, and unwillingness or inability to coherently picture them*. The work expresses an identity crisis that craves reconstruction yet struggles for suitable building blocks. In this respect, the dated quality to graphics and faded colours in early works (as in Sucher 1997), offer a preserved inheritance or tradition, a received context that proves impossible to accept, irresistible to disrupt. The parts never quite add up, but parts are all the artist can play with. It is significant for example, that many works are assembled from sheets of paper mounted on canvas, embodying the fragmentary and frail foundation to the bigger picture. And what is built from them is essentially ad hoc, ramshackle. Roles for figures remain crude yet enigmatic (Wahl 1998) and ultimately represent an unattainable abstraction, a nowhere man at home in a nowhere land. The anxiety over identity actually leaves only an array of disparate – often desperate - roles and fractured occasions on which to practise them. Notably, a work from 2005 and show at Wolfsburg in 2006 take the title of New Roles (Neue Rollen). The concern with roles and identity develops in surprising ways. Unstable roles begin to erode tasks and products that define them. Between 2000 and 2002 the ostensible tasks of cultivation and manufacture introduce bizarre vegetable and animal humanoids (as in Alter 2001, Orter 2001, Busch 2001, Märznacht, 2000) as well as mechanical or robotic figures (as in Tabu 2001, Quiz 2002). In other works, giant larvae develop into human form (as in Hatz 2002, Kuhlraum 2002). At this point, science fiction would seem a more likely inspiration than Socialist Realism or Surrealism and presumably, the artist's admiration for the work of Matthew Barney (The Cremaster Cycle in particular, further intertextuality in general) finds some reflection. In Rauch’s work, the worker has either become so absorbed in their task that they begin to resemble their products, or anxiety over identity has in some way spread to the product, so that it begins to resemble the worker. It is both a comic and deeply disturbing prospect and as a metaphor for neurosis could hardly be better. As noted, such beasts continue to appear in Rauch’s work, but this conflation of person and product gradually gives way to vividly coloured historical and mythical figures and more ceremonial tasks with a military undercurrent (Vortrager) in 2006. These in turn yield to more leisurely or socialising activities, now mostly in period dress by 2007. At the same time, a theme of excavation appears, literally as a gold mine, (as in Goldgrube 2007) or creating upheaval and unearthing other myths (Die Fuge 2007). It is tempting to see this shift as a reflection of the artist’s growing reputation, of the need to see himself now within a longer (or deeper) tradition, albeit against a narrower array of roles and metaphorically re-examining his roots. Works from the 2008 show, like the Metropolitan Museum of Art show, took the theme of ‘Para’ – meaning beside or beyond, usefully suggesting an adjunct or intermediate body – which in this case might apply equally to roles or pictures. Works featured a figure crowned by peers, (Krönung I 2008) a father cradling his miniature father (Der Vater 2007), recalling the earlier Der Pate (2005) of a godfather and godson. On these, commentary typically notes that the artist was orphaned at an early age and raised by his grandparents, a rare acknowledgement of a psychological dimension to the work and consistent with the preceding interpretation. But these works also announce a little too much self-awareness, nudging self-indulgence, as does the work tellingly titled Der Nachste Zug (2007)- The Next Move - where world-weary young toffs sit plotting (although one forgives a lot for the stylised cigarette smoke, with its calligraphic flourish and pun on the artist’s name). Elsewhere in the show, artists are pictured earnestly sketching, or bored and literally on a plateau, (Das Plateau 2008) struggling for inspiration. Whatever the reason for this change, the work loses something. The problem is really that form has been sacrificed for content. Where the paintings maintained reference to a graphic style (and to some extent Pop Art) this allowed painterly treatment to distance itself from both picture and subject, in a way that gave them a distinctive expressive charge, a brusque contempt. That fades as works gradually introduce more colour and tone, less prominent outline, become more unified and literal. The work now asserts a faith, if only in the powers of illustration. The reference is no longer to a graphics source, not even science fiction illustration, properly, but rather to painting’s own stock resources for figuration. This is why the work begins to look more like late Surrealism rather than a richer, more compelling mix. Painterly treatment is reduced to just sketchy background details or skies and the result is banal, possibly kitsch, as some critics quickly note. 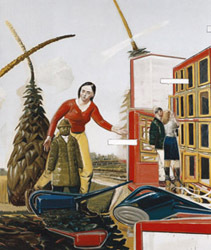 The paintings still incorporate graphics elements, like the silly cartoon hands to Der Vater (2007) and captions as in Parable (2008), or the graphics of Unter Feuer (2010). Drawing still engineers deft quirks in perspective and scale, but they are no more than tics or trompe now and only beg the stylisation and objects that would contest them.